I have two drives on my MacBook Pro. One is a SSD with the root (/) partition, and the other is a hard drive with a home directory partition (/Users). Both partitions are HFS+ format. 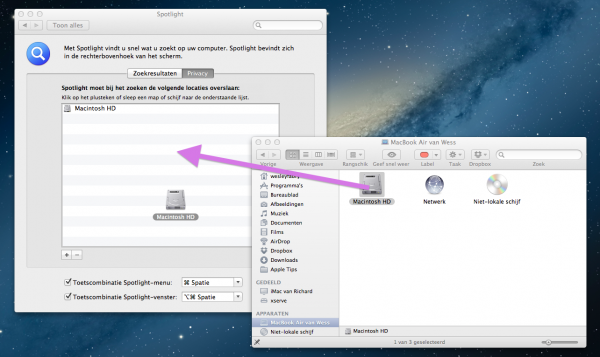 When I make a search using Spotlight, nothing on the /Users partition is searchable, since it is not indexed. Turns out this is due to having the nobrowse mount option set for the affected partition. Removing this option for the partition's /etc/fstab line fixes this issue. Not the answer you're looking for? Browse other questions tagged spotlight indexing . How can I fix the Spotlight index for an encfs-mounted directory? How to index one folder on a (huge) smb shared drive for Spotlight?